CAS Honda, the official Honda UK 250cc World Motocross championship team, is running motocross riding schools at Corby Trials Park. Courses cost £80 a day per rider, which starts at 10am and runs until 3pm in winter or 4pm in summer. 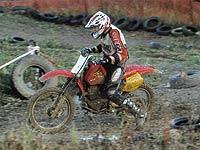 For your money you get a full day riding either 250cc or 400cc four stroke Honda XRs at the very demanding track. All kit is provided at no extra cost so all you have to do is get a group of mates together and turn up.